Let me begin with a confession. I am hiding things from you. I am sitting at my computer, selecting from the information in my head. What I have just written and will now write is the manifestation of my deliberate and ardent desire to direct your thoughts, to rule your brain for the following 600 or so words. For as long as I hold your attention, I wish to wash your thoughts with mine. Not because your thoughts are dirty and need cleaning. But because mine are blue and yours are pink or green. The aim of my washing is not to cleanse. The aim of my washing is to run the colours together. To create. Some of the colours of my washing are beautiful, brilliant, temporary. Some of them are staid, boring, difficult, ugly. I wish only for us to mix our colours in the hope of capturing the beautiful, mastering the brilliant and dislodging the staid, the boring, the difficult. Perhaps to create a third, more intriguing category: substance and beauty together. Either way, it is best that we share our colours, all of them. Do not peacock the brightest to hide the dullest for that is fraudulent. 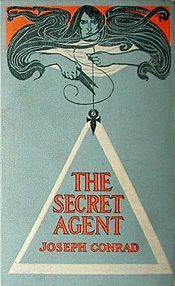 That is the lesson of The Secret Agent. The book strips away the sophistications of modern life, of modern politics, the secrets and dirty laundry that make up so much of what might be described as ‘urbanity’. Stevie, a classic Shakespearean fool, is more revealing in his view of the world for being ‘innocent Stevie’. He does not see in colours especially. He sees the world as black and white. Recognises evil when it is evil and does not dress it up as anarchy or politics, love or business. He is the instinctive being in a mechanised and polluted world. Nature in this book does not look kindly upon the city: “A peculiarly London sun – against which nothing could be said except that it looked bloodshot – glorified all this by its stare”. This is a book about confession, about the importance of truth and the danger of concealment. It reveals the dangers that lie in petty lies, that lie in dirty laundry, that lie in the narrow alleys “littered with straw and dirty paper, where out of school hours a troop of assorted children ran and squabbled with a shrill, joyless, rowdy clamour.” This is a book about approaching those alleys, metaphorical and physical, and exposing them to the bloodshot sun so that we and others can see, clearly, their colours, we can show our own colours and we can mix them, wash them, or indeed, if we choose, cleanse those colours or finally, and better still, we could expunge them all and be pure.